Vijay complained that he has been continuously performing well in shooting, but never considered for any reward. 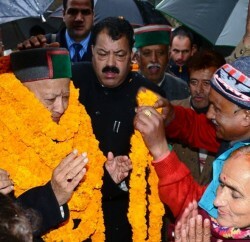 He also complained Himachal Pradesh government attitude towards him as well, he rued that even his home state never considered him for any state award, despite being winning many medals on international level. He said that after 2010 CWG, Haryana, Punjab and other states gave promotion to their players, but Himachal Govt ignored him for Parshuram and Himachal Gaurav award, which are given to those players who perform well at national and international level. Vijay Kumar is Six-time national champion; he had won two silver medals at ISSF’s World Cup. And though he missed out on a medal in rapid fire event at Guangzhou Asiad, he won two bronze in air pistol and center fire pistol. He also won gold at Doha Asian Games. He is right. Not only the home state even the media treated him poorly. He has brought a Silver Medal from the OLYMPICS but the coverage he got as if he had won a district level tournament. Pity!! !